White Paper Abstract: Detailed evidence-based care plans that follow high-risk patients through episodes and transitions of care help these individuals and their providers assess the necessary level of care, evaluate available services and empower patients with goals of care, impacting care quality and health outcomes and enhancing patient experience and engagement. A majority of healthcare organizations—83 percent— incorporate care plans into value-based healthcare delivery systems, according to a December 2015 survey by the Healthcare Intelligence Network, with more than half of remaining respondents planning to do so in the coming year. 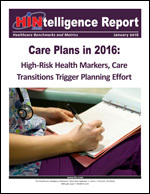 Download this HINtelligence report for more data on care plan strategies, how patients are classified for care plan needs and the typical length of time in which a care plan tracks a patient.